In an urgent need for its image makeover, the scam-tainted coal sector will require mammoth efforts in 2015 from the government and the corporates, after a year full of adversities and stuck projects undermined investments totalling billions of dollars. The least glamorous among all raw materials, coal turned out to be a pricey affair in 2014, but a silver lining appears on the horizon with the courts and the government stepping in to overhaul the entire process of mine allocations. In a historic judgement, the Supreme Court this year cancelled 204 mines alloted since 1993, while terming those allocations as flawed. Those affected by the decision include biggies like Jindal Steel, Essar Power, GVK and JSW Steel. Among these, billionaire Naveen Jindal-led Jindal Steel and Power Ltd (JSPL) had to shelve a 10-billion coal-to-diesel project, while casualties continue to pile up from the controversy and the alleged scam in this sector, which has come to be known as 'Coalgate'. The companies that had got these mines claim to have invested close to Rs three lakh crore (Rs 3 trillion)in the coalblocks and further Rs four lakh crore for their end-use plants. Making a hue and cry over the issue, the companies said such mass-cancellation of mines would hamper supply of this core fuel for the power sector in a country that is targeting to take electricity to every home in next few years, while adversely impacting the investment sentiments in a big way. The government watchdog CAG had earlier estimated a Rs 1.86 lakh crore (Rs 1.86 trillion) presumptive loss to the exchequer on account of allotment of 57 coal blocks without competitive bidding. 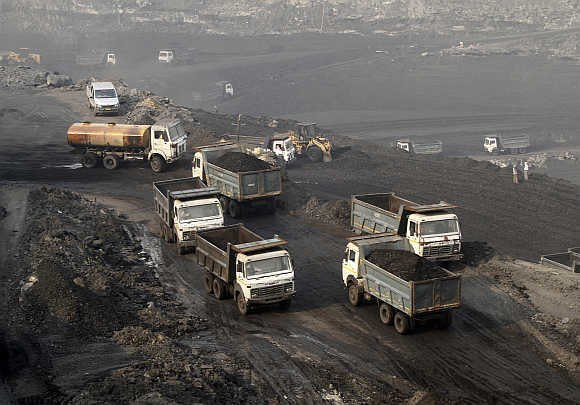 Soon after the court order, the government came out with an Ordinance to conduct fresh allocations of the affected coal blocks through a "transparent" e-auction, but the bill continues to hang in balance and a re-promulgation might be required soon as a permanent law remains elusive. The Left parties and several trade unions have opposed the e-auction of coal blocks and the enabling provision in the Ordinance that allows commercial mining by private firms and have sought its reversal, while warning of a nationwide strike if the Centre went ahead with the changes. Allaying concerns that the move would pave the way for de-nationalisation or privatisation of the coal sector, Coal Minister Piyush Goyal has said that the government was in fact strengthening the PSU major Coal India Limited. Beyond the coalblock controversy, the new government, headed by Prime Minister Narendra Modi, has announced an ambitious target of doubling the coal behemoth CIL's output to about one billion tonnes by 2019. Coal India, which accounts for over 80 per cent of the domestic coal production, has incidentally been headless for almost six months and has been facing production constraints and labour union related problems on a regular basis. The new government has also given charge of both coal and power ministries to Goyal, a move seen as being aimed at avoiding conflicts between these two ministries. Gearing up for a fresh allocation of the blocks cancelled by the Supreme Court, the government has meanwhile decided to auction 65 mines to private players while 36 other blocks will be directly allotted to state-owned companies. Of the 101 blocks to be alloted and auctioned in the first lot, 63 mines would be given to the power sector, while the rest would be for sectors like steel and cement. Out of these, government is targeting a revenue of Rs 1.47 lakh crore (Rs 1.47 trillion) from the allotment and auction of 92 coal blocks.